Although in the form of a flask, this vessel was used at Georgian wedding and other important feasts as a goblet. As such, it was not intended to have a stopper. It comprises silver mounts patterned with fine niello work over a polished coconut. The vessel has a long neck and a flared foot. The neck is decorated in niello with alternating floral bands reminiscent of Ottoman floral work. 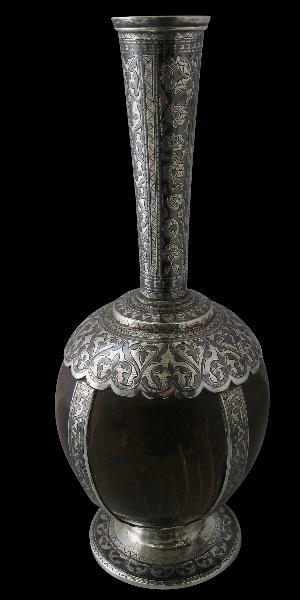 The shoulder and the four silver bands that lay over the coconut have scrolling arabesque work. The foot also has scrolling vegetal motifs. similar goblets are illustrated in The Caucasian Peoples, catalogue for an exhibition of the Russian Ethnographic Museum, staged at the Hessenhuis, Antwerp, Belgium, 2001, p. 161.